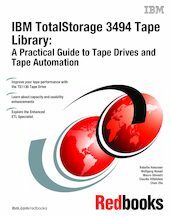 This IBM® Redbooks® publication is the ninth edition of the best selling Tape Library Practical Guide, which was first published in 1996. This book is the indispensable companion for a successful implementation of IBM TotalStorage® Enterprise Tape Drives 3590, IBM TotalStorage 3592 Tape Drives and Controllers, IBM System Storage TS1120 and TS1130 Tape Drives and Controller, and the IBM TotalStorage Enterprise Tape Library 3494 in your environment. This book explains how to plan for and how to install the tape products and library in various enterprise platforms. It considers day-to-day operations and integration with other products and applications. It also provides information about data migration and operational considerations. This document was written for storage systems technical professionals who implement IBM tape drives and libraries. The present version of the book has been updated with the attachment of the IBM TS1130 Tape Drive and usability enhancements of the IBM 3494 Tape Library.